This is the first in a series of three posts detailing the construction of a wort pump (March pump) in a toolbox housing for a home brewery. This post deals with the concept of the pump build and why someone would want a wort pump. The second post addresses construction of the pump and toolbox combination. The final post discusses alterations to an immersion chiller to allow the use of the pump to speed cooling. Getting a high-temperature food-grade pump has been on my list of brewery upgrades for a while. Pumps can speed the process of cooling wort, when combined with an immersion or plate chiller. They also speed the process of moving wort to fermenters faster than a siphon or gravity transfer. In my particular case, the pump allows me to use my kettle's ball-valve assembly, which pulls through a stainless steel hose braid. My previous attempts to drain wort through the valve via gravity have failed because gravity draining does not overcome the resistance offered by the hose braid. a single tier or level. In these cases, the pumps are often mounted with a splash guard or shield because the pump housing is not sealed and the motor can be damaged if exposed to a liquid. However, my brewing system must be dismantled for storage after each use. So I needed a way to keep my pump portable, but to also protect it from the splashes that can occur during a brew day. Along came an idea I first saw in Brew Your Own (BYO) magazine - install the wort pump in a toolbox. Pump housed in a large enough tool box to fully dissipate any generated heat. 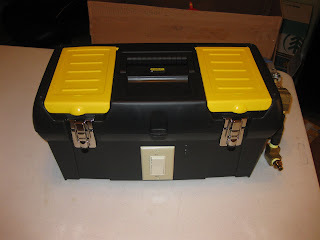 Tool box has long extension cord that winds up for easy storage. Pump is connected to a low-profile switch that allows for easy turning on and off. Tool box has an additional outlet built in to provide power for miscellaneous brewing devices, such as a drill-mounted grain mill. Pump output can be throttled down, which allows for slow distribution of wort to fermenter, without disturbing settled break material and hops. Equipment makes use of quick-disconnect fittings for easy of disassembly. Tool box remains fully functional and allows storage of small brewing ingredients or equipment.